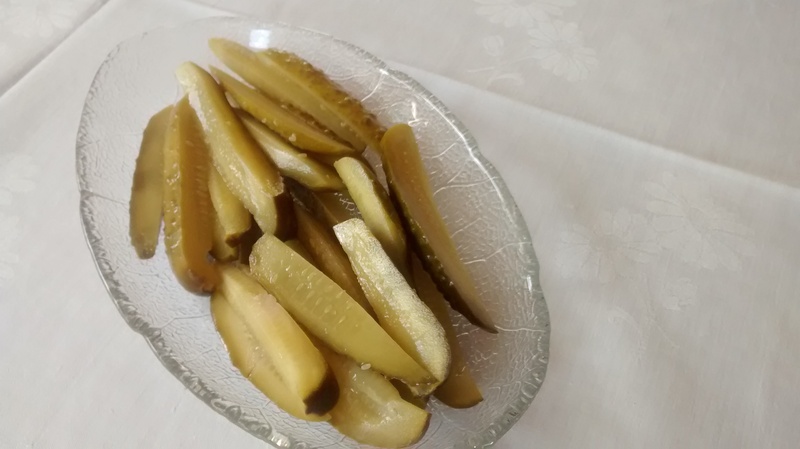 Gherkins are cucumbers that have been fermented in brine or pickled with vinegar. Botanically cucumbers are fruit although they are a vegetables from the culinary point of view. In Polish the word ogórki means cucumbers. Kiszone ogórki means fermented cucumbers – either in brine or vinegar. 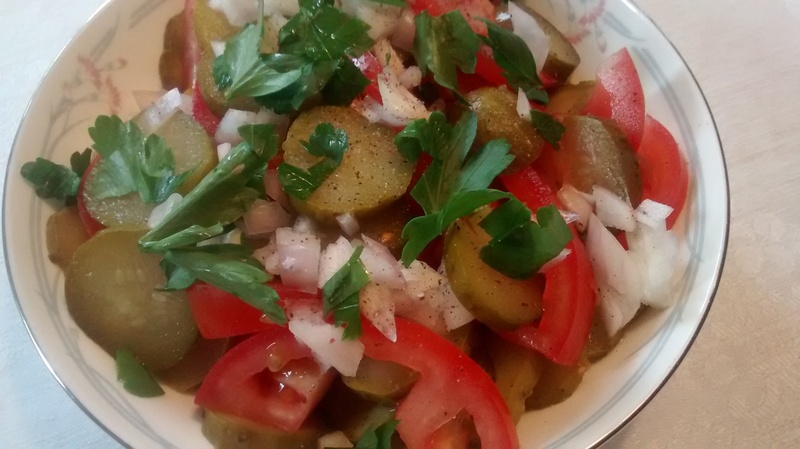 Letnie ogórki means summer cucumbers – which are fresh salad cucumbers. The Latin name for the cucumber is Cucumis sativus and it is a member of the gourd family and so related to pumpkins and melons. It is thought the plant originated in India and then was taken to Greece and from there to northern Europe. I have read that the making of pickles by fermenting in brine is over 4,000 years old. This would preserve vegetables throughout the winter – well before the days of frozen food and supermarkets! A quick look at the journey of the word – Gherkin – according to several dictionary sources. This is a word that started in Greece and travelled to England & America via Poland, Germany and The Netherlands. Angourion – Medieval Greek for cucumber. 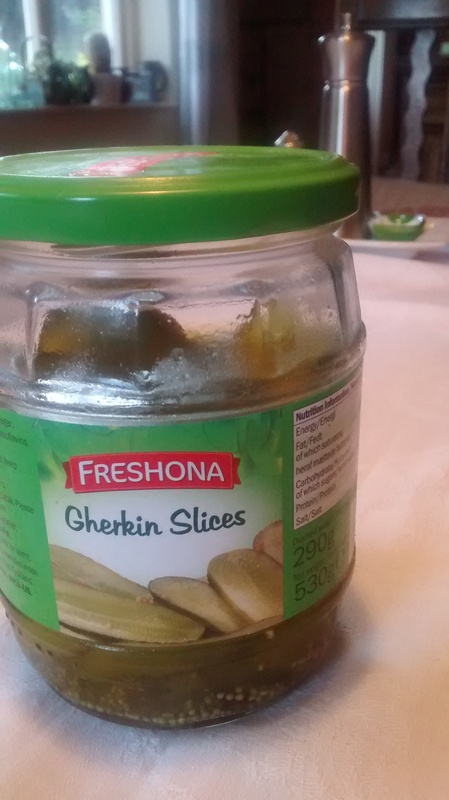 In Poland, July & August are the main months for making gherkins at home and once when I was there at that time in my relatives’ houses every container seemed to have been put into use for a stage in their production. Everyone has their own special recipe using brine and sometimes vinegar with the addition of garlic and herbs and spices – the most often used is the flower head of the dill plant – hence we get dill pickles. Some methods are very quick taking just a few days others take longer. The type of cucumber used is a different variety than the salad cumber it is shorter, fatter, often knobbier and has a lower water content. I cannot at the moment give you a good recipe for making gherkins as I have rarely seen the right variety of cucumbers for sale in England – maybe now with more Polish shops I might see some next year and try out some recipes. 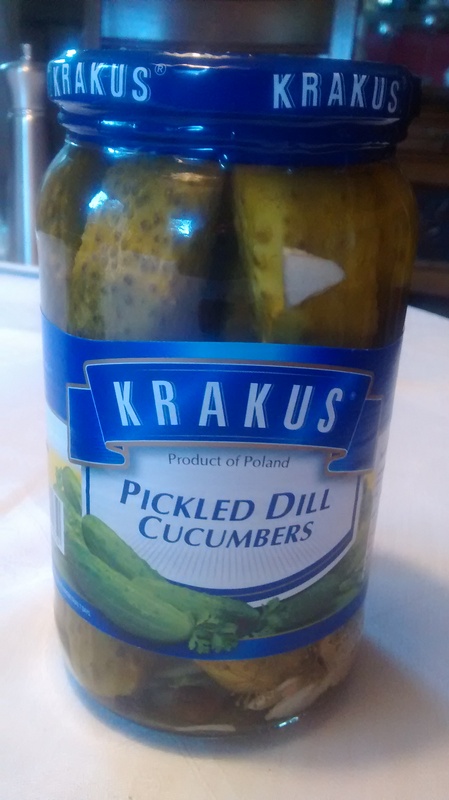 The bought gherkins I like are the Polish Krakus ones. Another type I like are ones you can buy in Lidl – these are made with sugar and vinegar and are sliced lengthways – they have only a slight vinegar taste and are sweet – I do not like the very vinegary kind. 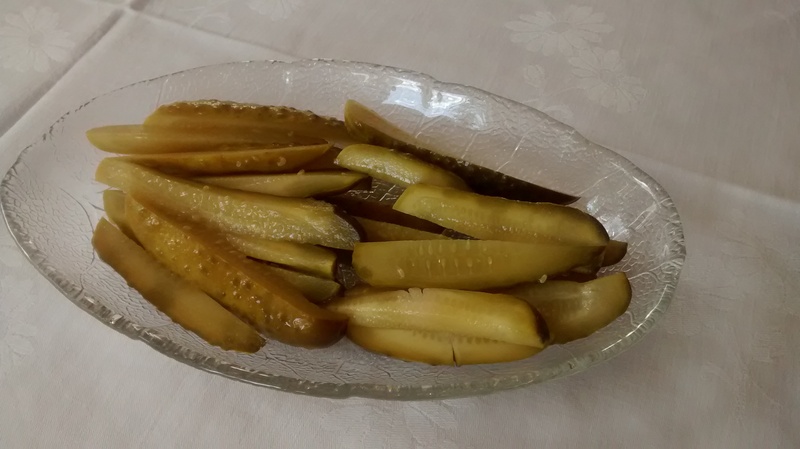 There are many uses of gherkins in Polish cookery – the most famous must be gherkin soup – which I just love – but that recipe I will cover later once I start to write about soups. 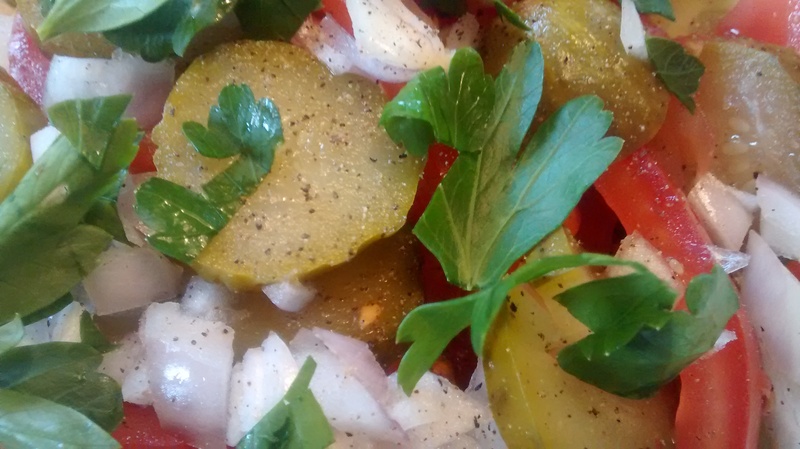 Of course gherkins – form part of many salads. In a bowl mix together the gherkins, tomatoes and onions. Sprinkle with a little salt and add 1 or 2 tablespoons of the liquid from the gherkin jar (if none is available then use some lemon juice) and mix again. Place into a serving dish and sprinkle with chopped flat leaved parsley and freshly ground black pepper. Yes I am really impressed with my with the camera on my MotoG phone. Next Next post: Poles Adopt The Potato and Make it Their Own!